Skin care for wrinkles and saggy skin involves the use of different types of natural face packs at least once in a week. You can prepare these face masks at your home by using ingredients like honey, lemon juice, sour cream, yogurt, etc. that facilitate skin tightening. More often than not signs of aging appear sooner in individuals taking an improper diet. Moreover, factors like sun exposure, smoking, stress, and several other lifestyle factors also affect the skin. Thus, it is essential to maintain a healthy lifestyle in order to maintain healthy skin. Plus, follow a good skin care regime including cleansing, toning, and moisturizing to remove dead skin cells, dirt and keep the skin moisturized. • Taking facial steam is one of the most popular natural remedies for reducing problems like dry, saggy skin and wrinkles. To prepare this, you need to add four tablespoons of dried chamomile flowers, two drops of carrot essential oil, and the same amount of lemongrass essential oil in a pot of boiling water. Expose your face to the steam for about 10-15 minutes. Make sure you clean your face with a light cleanser before following this steam treatment. You may replace lemongrass EO with fennel EO as the latter is considered good for removing wrinkles. • Put a few pieces of peach, half a cup of milk and an egg white in blender. Smear the resultant mixture on your face and neck and rinse it off after 20 minutes. Finally, wash your face with a facial cleanser and apply a moisturizer. • Mix a ripe mashed banana and a quarter cup of whipped cream, and squeeze the contents of a vitamin E capsule the recipe. Blend the mixture and apply it on your face and neck. Finally, wash it off after 15 minutes. • Another simple skin firming face mask can be prepared by mixing a tablespoon of plain yogurt and half a tablespoon of vitamin E oil in a beaten egg (egg whites, in particular help tighten skin pores). • In case you have oily skin then try this face mask. Whip an egg white, squeeze a lemon in it, and add four tablespoons of milk powder and a tablespoon of witch hazel. Blend these ingredients well to make a smooth mixture. Spread it on your face and neck, and leave for about 15 minutes. Rinse it off with lukewarm water to get soft and smooth skin. • Apply a combination of two tablespoons of green clay, one teaspoon of powdered millk and add enough water to form a paste. Tighten your skin and cleanse the pores by applying this paste on your face and neck for almost 15 to 20 minutes. • Aloe vera stimulates the production of collagen and elastin, and hence, helps reverse the degeneration of skin. So, you can apply a simple facial toner prepared by mixing aloe vera juice and water. • Applying a combination of a tablespoon of aloe vera gel and one teaspoon each of honey and mayonnaise also works as an effective cure for face-lifting. • Regularly massaging the skin with sweet almond oil or castor oil also works as an easy anti-aging home treatment. Similarly, rubbing a piece of tomato on skin and then rinsing it off with cold water is useful in getting rid of sagging skin. It can remove blemishes as well. • Combine three tablespoons of ground seaweed, two tablespoons of aloe vera gel and about four drops of fennel essential oil. Apply this mixture on face and neck for around 20 minutes and then rinse it off with warm water. • Make a natural skin toner at home by adding together a quarter cup of cabbage juice, a quarter cup of rose water, half a cup of carrot juice, and two tablespoons of wheat germ oil. • Prepare an anti-aging exfoliating beauty care recipe by blending two teaspoons of cinnamon powder, half a teaspoon of turmeric powder, a tablespoon of olive oil and some salt. Leave it on your skin for 15 minutes and then scrub it off. Finally, splash cold water on your skin. 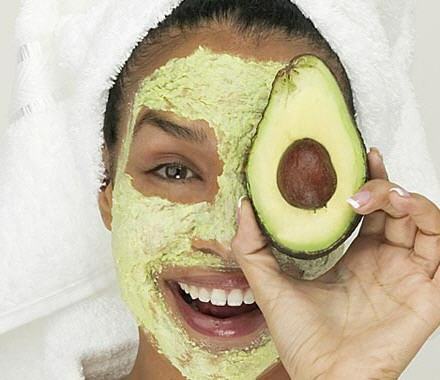 • Blend a quarter cup of mashed avocado, a tablespoon of plain yogurt, two tablespoons of honey, and an egg white. Apply this face pack for about 10 minutes and then wash it off with lukewarm water. • Another way to tighten sagging skin is to apply a paste prepared from sugarcane juice and turmeric powder for 15 minutes. You may use a combination of sandalwood powder and rose water as well. Check out this video giving information on facial yoga exercises to help tone your skin. • Treat your skin with a rejuvenating facial spa at home by applying a mixture of one tablespoon of vodka and two tablespoons each of witch hazel, watermelon juice and distilled water. • Soak a cotton ball in a combination of rosehip oil and juice extracted from a cucumber. Apply the solution on your skin and rinse it off with cold water after 15-20 minutes. • Applying a combination of a tablespoon of honey, a tablespoon of olive oil, and lemon juice on your skin for 10-15 minutes works as a wonderful homemade skin care recipe for aging skin. Follow this therapy two times in a week. Moreover, try to get enough sleep and fresh air. You may also consider practicing yoga to maintain healthy skin and body. Certain facial yoga exercises, in particular, are highly beneficial for eliminating wrinkles and getting younger looking skin. Besides, you can add a few drops of Frankincense, sage, or lavender essential oils in your night cream to make the skin supple and firm. i have used many types of masks and i have found they help the problem temporarily but just do not fix my face blemishes. I recently found Dahryn’s Silver Gel which tightened up my skin and i feel a ‘glow’ to my face when i use it.